I was initially worried when I began the install: it warned that the process may take an hour or more (didn’t jot down the exact wording). But, after 9 minutes, the Service Pack completed…or so I thought. Required a reboot, at which time it began the real install, notifying that it was Installing Service Pack: Stage 1 of 3. Since this looked like the part that would take a while, I went to bed and let it finish on its own. 1. 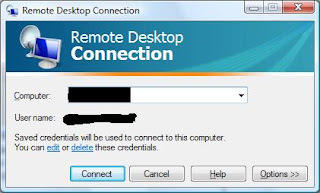 Remote Desktop Client: links to edit previously-saved credentials. 2. Control Panel: loads much faster than previous…one of my personal pain points with Vista. 3. Seems to load faster to login and to Desktop. Noticeably. 4. Start menu more responsive. 5. Change to the Search function of Start Menu. 6. 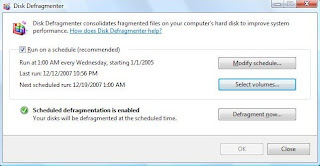 Defrag change to allow selecting volumes. If anyone has any specific requests for me to look at or into, please leave a comment!